It’s time for more blurry pictures! If I realized I was going to be spending this much time on this guitar modification project, I would have purchased a proper digital camera to take pictures, rather than use my Droid. Oh well, I made my bed, so now I’ll have to sleep in it. A few days ago, I finally was able to begin painting the guitar body. Now, I feel like I can finally see the light at the end of the tunnel! Firstly, I have to refer anyone reading this who has even the slightest interest in custom finishing a guitar to this forum. This is a thread on a Telecaster Forum by a guy who goes by the handle of Buckocaster51. When it comes to posting step by step tutorials on how to custom finish guitars in a variety of ways, including adding rich sparkle finishes, this is most definitely the place to go. I plan on following his instructions very closely. 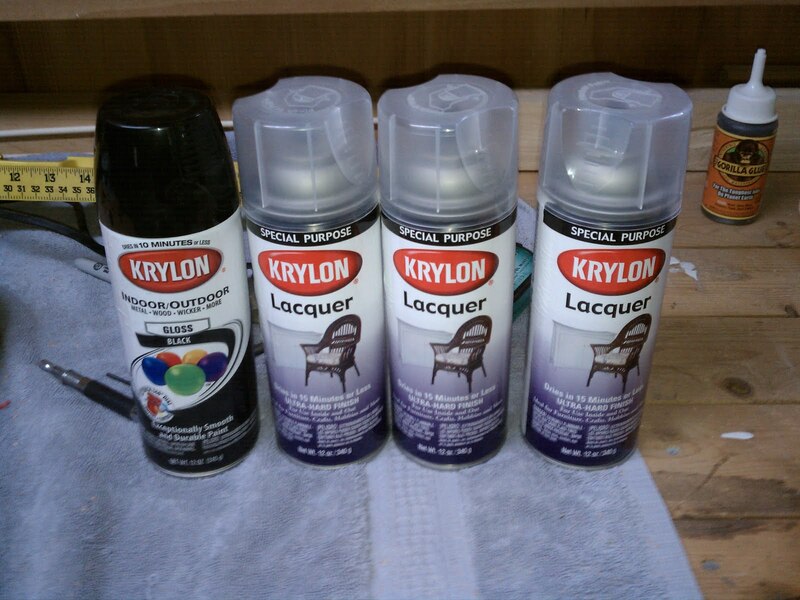 The first thing I did was to head over to Sherwin Williams to purchase paint and lacquer. 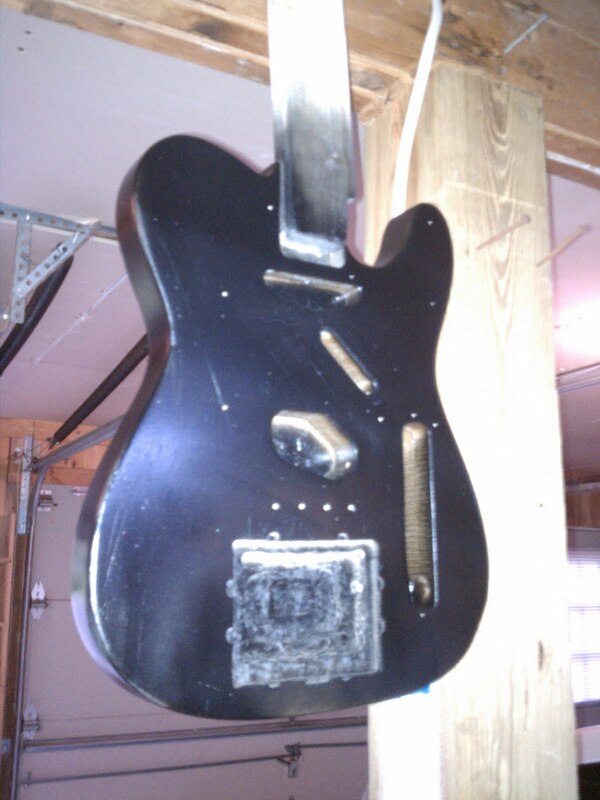 The black spray paint will function as a base coat for the body of the guitar. This is important as it is possible that some of this color will show through thin areas of the black glitter coat. Ultimately I plan to apply enough glitter for this not to happen, but why not cover all the bases? The lacquer will be used in two ways. First, I will apply a thin layer above the coat of black spray paint to provide a “tacky” surface to which the black aluminum flake may adhere. Secondly, I will build MANY layers of lacquer above this to provide that nice, think, clear finish for the guitar body. So there are a few things to note in the above picture. I didn’t bother to sand the body to a smooth finish, or fill in any dings or scratches because the glitter, and subsequent coats of lacquer will provide a smooth finish. You won’t see much, if any, of the base guitar body. I stole the idea of using a “paint stick” from Buckocaster. The neck pocket has five holes, pre drilled. Four to mount the neck (and neck plate), and one larger hole which was most likely used to hang the body during finishing at the factory. This hole is covered by the neck plate, and neck, so it doesn’t matter if this gets beat up a little. I cut a small piece of wood to fit the neck pocket, and loosely attached it to the body, through the finishing hole. This “paint stick” not only allows me to easily hang the body while the paint / lacquer dries, but gives me a convenient handle so as not to get very much paint on myself during this step. Nothing very exciting here, except for the fact that the body of this guitar finally has some paint on it! This view allows you to see more of the imperfections in the face of the guitar. Not to worry, these will be covered by the application of aluminum flake, and subsequent layers of lacquer. That’s all for now. I’ll post more pictures as this process progresses.